With the beehive up and running and your bees starting to establish their home, the role of the beekeeper changes. From the decision-maker and the architect as the hive is set up, the beekeeper takes on the role of observer and supporter. As we have seen many times, bees are extremely resilient and resourceful and, providing they are given a fair shot, will often be successful. 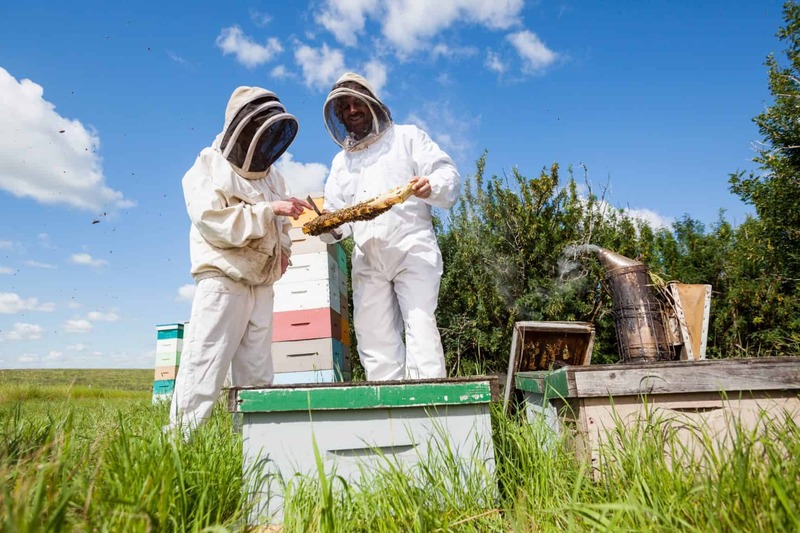 A regular and key part of the beekeeper’s role is the hive inspection. This occasional look inside the hive provides a brief opportunity to gather evidence of what’s happening. In Course 3 : A Healthy Beehive, we will be looking closely at the threats bees face. These threats require knowledge from the beekeeper. But there is a basic framework for each hive inspection, regardless of whether problems are observed or not. This lesson provides high-level guidance on how to approach an inspection, with much more detail to follow in Course 3. Preparation is key. Over time this will become second nature, but the new beekeeper may consider using a checklist at each inspection. There’s nothing quite like going through the whole process of suiting up, walking to your beehive, opening the hive (and hence disturbing your bees) – only to find you forgot something important, like a hive tool, back in the garage. Providing there is sufficient light and the temperature isn’t too low, an inspection can realistically be conducted at any time of the day. However, it is best carried out when your bees are out foraging. You will want to inspect when there is little or no wind and it isn’t raining. How is the brood pattern looking? Does the brood look healthy? Are there signs of imminent swarming? Are there any indications of mites? How is the colony reacting to your presence? Are honey stores growing nicely? Is it time to add more space, by adding a box? In some cases, earlier inspections will guide the nature of the inspection. For example, you may have detected an issue, taken action and are now in a position to assess the impact of your acti0ns. You do not need to look at every box on every inspection. If your “mission” is to assess the honey store then it may only be necessary to look at the upper box. But have that plan in mind before you open the hive. Just repeat that to yourself before each inspection! Your manner around and in the hive has a significant impact on how your bees react. Commit to slow, thoughtful, precise movements and your bees will normally reward you, simply by continuing their work. It’s perhaps a little strange to suggest you stay out of the way of your bees when you are going to rip the roof off the hive, break it down into separate boxes and take out individual frames, most full of bees! But there is something you can do to stay out of the way of your bees – work from behind the hive. Your bees will have a well-established “flight path” to and from the entrance. While you are inspecting the hive, this should continue. Before you open your hive, take a look at the activity. All being well, you will see plenty of movement in both directions, with workers coming back with their foraging rewards. This is one of the joys of beekeeping, so enjoy it but also take note and learn. But do remember to stay out of their way by ensuring neither you or any helpers walk in front of the hive. Use a smoker if you feel the need, to make you or your bees more comfortable. But, over time, get to know your bees. There may be times when smoking is unnecessary. Remove the top cover and place it aside, being careful not to trap any bees. Do the same with the inner cover, which will have more bees on it, probably on both sides. Depending on the design of your top cover, in its inverted state it may be a good place to put your boxes as you move to others during your inspection. With the upper box exposed, it’s time to take a look at the inner hive. 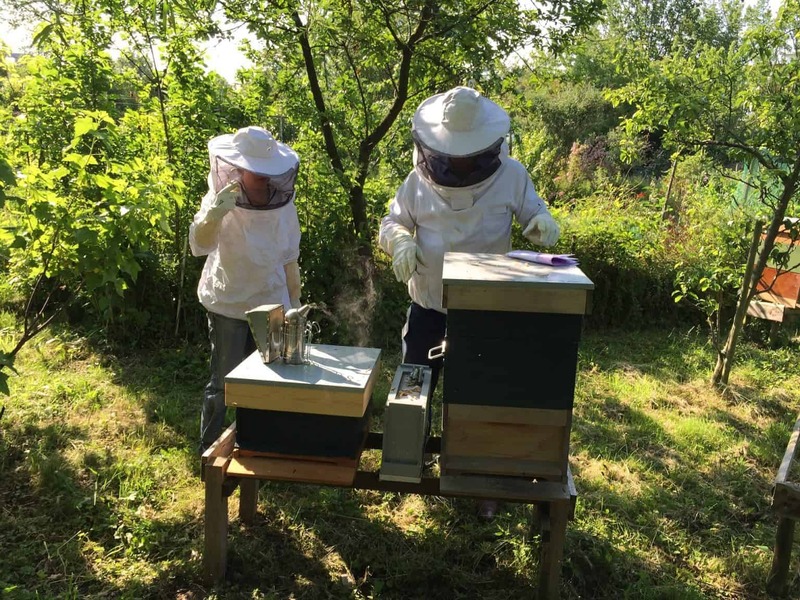 We will look at the process of lifting and inspecting frames in Course 3 : A Healthy Beehive. An important factor, though, is to be organized and methodical. Many a beekeeper has put a hive completely back to together and, in walking away from the hive happy with the inspection, noticed that forgotten frame resting outside the hive. Don’t be that beekeeper! Have method and a deliberate approach to inspecting each box, building good habits from the outset. Start by removing and inspecting one or two frames at the end of the box and putting them aside. This provides enough space to shuffle the others along, one-by-one, as you inspect them, without having to place them aside outside the box. Avoid placing any frames on the ground, if possible. 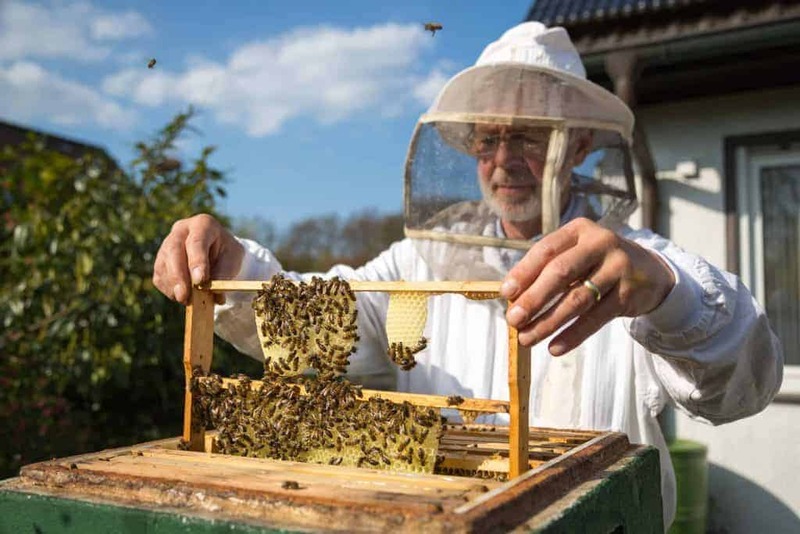 One option is our Ultimate Hive Stand, which has built-in frame holders that swing out and can be used during an inspection to hold frames off the ground. When inspecting frames from the brood box, hold the frame over the box. If the queen falls off the frame for any reason, you want her falling right back into the box! This is particularly important if her wings have been clipped, in which case she would be unable to fly back to the hive. Closing the hive is straightforward but, again, it’s easy to be forgetful. An example might be leaving off the inner cover. This is easily fixed but there is no harm in using a brief checklist, even if checked only when you believe all is finished. A determined bee can find her way into the cracks and crevices in protective clothing. While unusual, just be aware of this possibility when removing your protective clothing. There is little more frustrating than remaining stingless around the hive, then being hit when you are nowhere near the hive, while taking off your bee suit. Many beekeepers who have beekeeping buddies do a little “swirl”, just to visually check there are no stowaways! With all done, leave some time to take stock of all you saw. Finalize your notes, using whatever process you use (paper, app, etc). Make a quick note of anything you think you should check next time, as a reminder. I have been stung several times while removing my suit.